Here's a double invitation for you! What if you could share unique intelligence and stunning visual reports from the Witbe Robots KPIs? This is Datalab and we're ready to show it to you next month in New York and Atlanta! This Witbe Technology will enable you to get more from your data. Featuring the new integrated Video Quality Incident Detector (VQ-ID) algorithm, Datalab will help you easily unveil the root cause of your services degradation, with its instant filters and drag and drop dashboard builder. 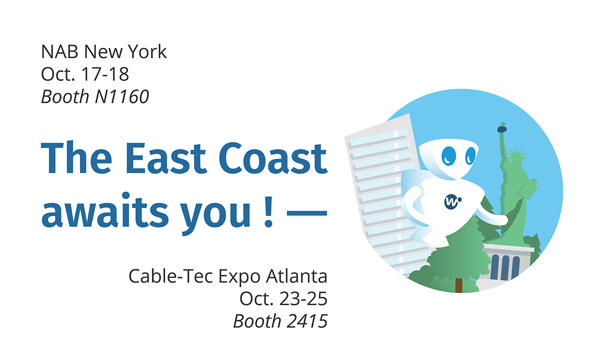 Let's schedule a meeting next month on the East Coast, either for NAB New York (October 17th-18th) or for Cable-Tec Atlanta (October 23-25th).